The new all-suite, 166-guest American Duchess, has arrived in New Orleans to undergo final preparations for her August 14, 2017 inaugural sailing. 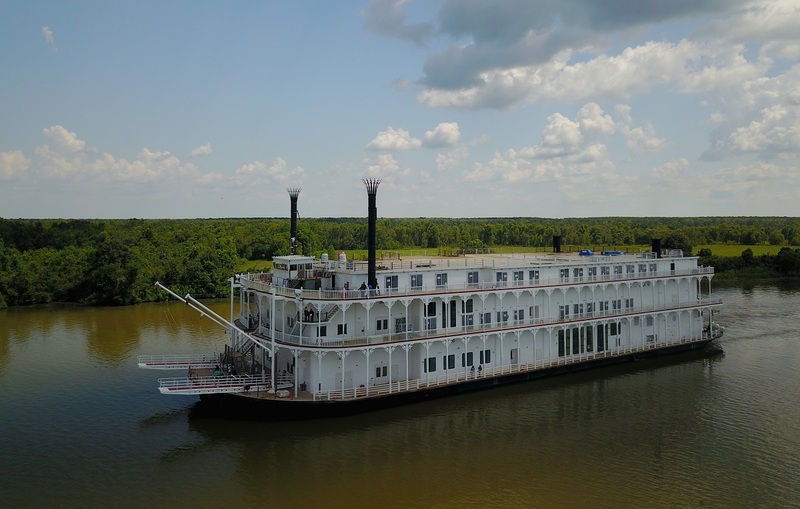 The American Duchess is owned and operated by the American Queen Steamboat Company (AQSC) and the luxurious paddlewheeler will join the American Queen and American Empress to become the third vessel of the riverboat company. The first purpose-built boutique paddlewheeler will now receive thousands of pieces of furniture, delivery of soft goods and final coats of paint. Training will commence for her all-American crew along with provisioning for the inaugural season. The American Duchess will offer guests an intimate experience through America’s heartland with the largest suites on the river in every category, which will be fitted to the American Queen Steamboat Company’s highest standards. The 166-guest American Duchess follows in the pedigree of the line’s namesake American Queen, sailing the mighty Mississippi and her tributaries. New for the line, the American Duchess will offer overnight stays in port including the heart of Nashville as well as shorter roundtrip itineraries from the “Music City” and New Orleans. For added convenience, guests can also enjoy departures from Chicago (Ottawa, Il.) for the first time. The American Duchess will feature a generous space ratio showcased by three 550 sq. ft. Owner’s Suites, four 550 sq. ft. Loft Suites, a U.S. riverboat first; and spacious Veranda Suites and Interior Suites. The new vessel will be incorporating the highest standards of service, entertainment and shore excursions customers have come to expect from the American Queen Steamboat Company. Featuring open seating with two dining venues, The Grand Dining Room and The Grill Room will offer regionally inspired cuisine similar to that of the American Queen.